An article on the Earth and Sky website inspires my astrological musings this week. It is entitled: Two Comets to fly by Mercury on November 18 and 19. [Watch a video here http://youtu.be/v9Wzlu5quTUT]. Right now, two comets are on their way to a rendezvous with Mercury, Comet Encke and Comet ISON. With the mindset that everything is alive and everything is communicating, what might this rare event be offering us? Let’s fold it into the ongoing celestial story of this lunar cycle. Let’s muse on the nature of comets. Let’s allow the unexpected and wondrous to infuse our lunar intentions. 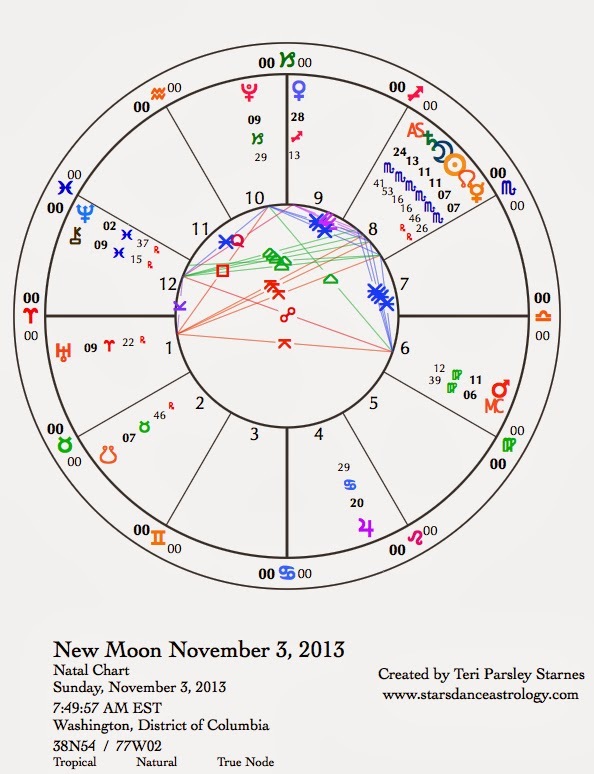 This lunar cycle began with a New Moon in Scorpio. * At the dark time of the year in the Northern Hemisphere, Scorpio invites us to embrace the wisdom of the dark. Perhaps you’ve been learning more about your own relationship to darkness. I know I have. Another very important layer to this experience of the dark has been Mercury’s retrograde journey through the dark of Scorpio, joining Saturn in Scorpio to add weight and significance. Another layer was the Solar Eclipse that inaugurated this lunar cycle with a twist of the unexpected, as the Sun was darkened by the Moon’s passage in front of it. And now two comets are rapidly moving towards the center of our solar system, passing very close to Mercury. Comets are visitors from the dark—dim regions that surround our solar system. As they break free from their comet nursery, they speed quickly towards the Sun; the closer they get, the brighter they shine, sometimes manifesting in showy tails streaming behind. There is a theory that icy particles from comets may have seeded our planet with water and perhaps even life. Are these comets seeding our experiences of the dark with new understanding and potency? Why, of course! I appreciate the encouragement from the cosmos to allow more room for the darkness within me. The velvet blackness isn’t empty, isn’t void of wonder or meaning. It holds surprises and unexpected allies. It holds a message just for me and just for you too. 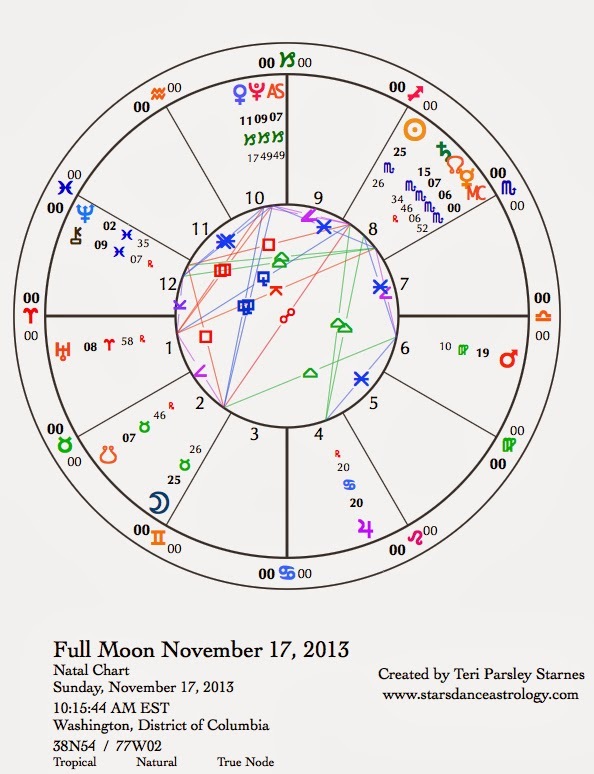 November 17—Full Moon: Illuminating. One of the beautiful things about a Full Moon is that the light does not entirely eliminate the dark. On the night of a Full Moon we see how to hold dark and light simultaneously. Every Full Moon shows us how to dance with opposite qualities without squashing either. At this Full Moon, observe how the Moon does this and invite that skill and grace into your life, too. This Full Moon stands in Taurus, the grounded earth sign of Spring’s fecundity. The prime directive in Taurus is to create and enhance stability. Scorpio, where the Sun stands, is dedicated to sensing into the transformative darkness. This seems as far from stability as we can get. Who knows what the darkness holds? Who can plan for the ways it will change us? If each pair of opposite signs has a gift to give the other, how do these signs benefit from this exchange? Rather than see stability and transformation as mutually exclusive, we have the opportunity to offer a little bit of each to situations that feel stuck or feel too uncertain. Where is the balance point for you? A major theme for the rest of this lunar cycle could be described as “Working things out.” Feelings have been stirred up from our deeper recesses. Now we have the opportunity to clear up misunderstandings, come to some conclusions, and understand ourselves a whole lot more. The ally bringing this all about is our friend—visited by not one but two comets this week—Mercury. Mercury forms aspects with Uranus, Chiron, and Pluto for the third time since this retrograde cycle began. [Next week on November 25, Mercury makes the third conjunction with Saturn, an important point of resolution.] 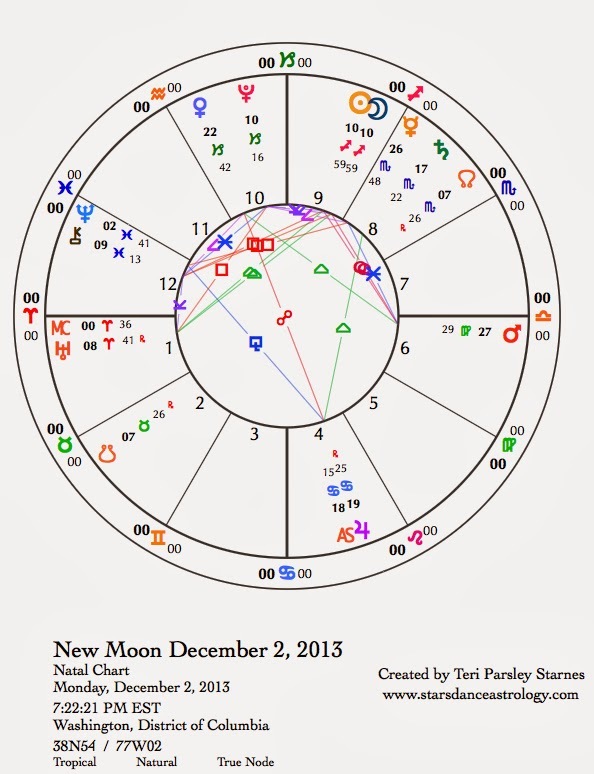 At the Full Moon, Mercury is conjunct the North Node. This is an expression of how we are evolving. Comets carry messages to the Messenger God, seeding new ways to understand our own souls. Let’s pay attention to that. Mars and Jupiter are teaming up to encourage us to bring wholeness to the hearth. As we near the Thanksgiving holiday, we don’t want to just go through the motions of honoring family obligations. There is a sense that a healthy home life is a basis of health and happiness in our whole lives. Gratitude comes authentically from this realization. Monday, November 18. The Moon in Mercury’s home sign is encouraging a connection with the quicksilver part of ourselves. Be expansive. We are more prone to making social connections and acquiring new knowledge. We may also be more prone to changing our point of view in order to bring about those connections and insights. Even though we’ve been going through a rough patch of fixed points of view, we lighten up today, at least for a little while. Although not visible with the naked eye, Comet Encke has a close encounter with Mercury today. Welcome strange visitors. Tuesday, November 19. Day two of comets visiting Mercury. Feathers may be more easily ruffled today than yesterday. Mercury is forming an inquisitive relationship with Uranus. People are being contrary. There is a need to think for ourselves and we may have a hard time listening to or appreciating another person’s point of view. This tension can be productive if we are looking for innovative solutions. A moderating factor is that Mars in Virgo is happily sextile to Jupiter in Cancer. If people are bugging you, spend extra time at home, maybe even cleaning a closet or organizing your desk. This effort brings inner peace. Wednesday, November 20. Today could be the first time since the Full Moon on Sunday that we truly slow down enough take a breath. The past few days have been stimulating. With the Moon in Cancer, we hear the call to slow down and process internally. Mercury is still busy making contact with Chiron and Pluto, but the impetus is to use this energy to be powerfully present to compassion. Are you developing your empathy muscles? Do what you need to take care of yourself even as your desire to help others expands. 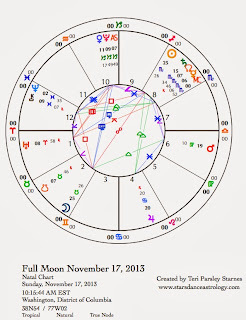 November 21—Disseminating Moon: Sharing. 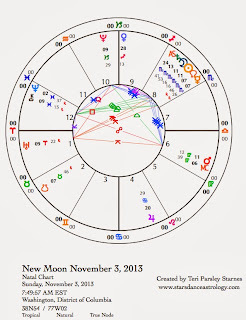 Take a moment to reflect on your experiences since the New Moon on November 3rd. What is the most resonant thing that comes up for you? Here’s the hard part, it may not be an experience you’d ever want to repeat. We have been going through some dark times. I don’t believe that everything happens to us for a good reason. Sometimes really bad things happen to us that we didn’t deserve or need in order to learn some important lesson. Sometimes this kind of experience is the harvest we are bringing in, and it isn’t fair. These are the times when the darkness is no longer a place to hide, but is a place where we see ourselves completely—what we are made of and the choices we wish to make. Even if you aren’t having this type of experience right now, someone else is. 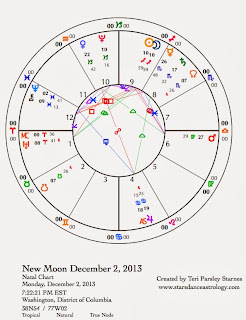 The disseminating phase of the Moon is a time to notice what we are harvesting from our experiences in this cycle. How do you greet this darkness? How do you tenderly take care of yourself and others? Heart open and seeing with clear eyes is a good way to greet the Sun’s ingress into ebullient Sagittarius today. To seal the deal, the Moon conjoins Jupiter too, the ruler of Sagittarius. We don’t have to immediately dive into forgetting our dark journeys of this cycle even though that may be the temptation. Notice how the pulsation from dark to light is a constant pattern. What are you learning? Friday, November 22. With the Sun and Moon in fire signs today, please embrace the upwelling of energy with joy and creativity. Water signs can give us comfort; fire signs give us hope. What brings hope to your life today? Share some of that energy with others. And look for those firey people waiting to share their energy with us. Fire likes to move. Saturday, November 23. The burst of fire energy yesterday may leave you feeling a little burnt out today. That’s another aspect to fire—learning how to tend the flame so we don’t have to experience those big swings of up and down. There’s still plenty of spark to this day, so find the thing that brings you joy and helps you reconnect with vital energy. Fire needs a solid container to be long living. Imagine your container is built by Venus and Saturn. Venus in earthy Capricorn makes a sextile aspect to Saturn in soulful Scorpio. This is the first of three times Venus makes this aspect with Saturn over the course of the next three months. Venus will be going on a retrograde journey this winter and spending an extended period of time in the sign of Capricorn. Venus likes this sign. She is able to bring harmony and balance to our quests for excellence. With Saturn’s help today, it is as if we want to take the creative fire energy of Leo and begin to create a masterwork, not just a pleasing sketch. What long-range dreams do you have for creative excellence? Dare to commit to that dream.